A proposal to develop the main chowks within Pimpri-Chinchwad Municipal Corporation (PCMC) limits is to be tabled at the civic body’s standing committee meeting. It will seek approval of expenditure to be incurred in taking steps to improve the flow of traffic at Wakad chowk on the westerly bypass, Dange chowk at Thergaon, KSB chowk in Chinchwad and Sambhaji chowk in Pradhikaran. Read the rest of the TOI article, Traffic control: PCMC to develop 4 chowks. Pune’s infrastructure has got a focus in Democratic Front government’s budget with Finance Minister Sunil Tatkare keen to make metro rail a reality in Maharashtra’s cultural capital and IT hub and at the same time remove the traffic snarls by investing in road infrastructure. The budget also has measures that would give a boost to its cultural importance – and also the stretch between Mumbai-Pune would be identified as a knowledge corridor as a policy measure. Read the rest of the Sakaal Times article, Budget bonanza for Pune, Pimpri-Chinchwad. In a move aimed at facilitating chawl residents to get water connections easily, the Pimpri-Chinchwad Municipal Corporation (PCMC) has decided to provide water connections to chawl residents even if they do not have permission from chawl-owners. The move, expected to benefit over a lakh residents of chawls in the industrial town, was, however, being seen by landlords as an infringement of their rights. A chawl resident seeking water connection will have to provide a residential proof and pay an advance of Rs 1,400 towards water bill and Rs 1,500 for meter installation. Read the rest of the article in the Indian Express: No need for chawl-owners’ permission for tenants’ water connection. Pimpri-Chinchwad New Township Development Authority’s (PCNTDA) ‘Shashwat project’ for paperless administration is almost ready. After the implementation of the project, all information regarding properties, including documents like lease deeds, demarcation of plots, building permission certificates and others will be available online for citizens. According to the Pune divisional commissioner and president of PCNTDA, Dilip Band, it will digitise all records in PCNTDA limits. Touchscreens will be installed at the PCNTDA offices, using which people can get printouts of land records. Read the rest of the article, Soon, all PCNTDA documents will be online. The Pimpri-Chinchwad New Township Development Authority (PCNTDA) has proposed a budget of Rs 783.99 crore for the next financial year. The budget has provisions for facilitation centres for industrial workers in sectors 7, 8 and 10. There is also provision for a residential township for middle income group (MIG) and low income group (LIG) on public private partnership (PPP) basis in sector 12. An eco-friendly office for PCNTDA at the Akurdi railway station, theme parks and traffic parks for children are some of the other features of the budget. Read the rest of the article, Rs784 crore budget presented for PCNTDA. A one-of-its-kind park, which will create public awareness on traffic discipline and offer a proper ambiance for neophytes to undergo driving lessons, will be developed by the Pimpri-Chinchwad New Township Development Authority (PCNTDA). The driving park, to be raised over 6.20-acre area at sector number VI in Nigdi Pradhikaran area, has a financial outlay of around Rs 5.48 crore. Divisional commissioner of Pune, Dilip Band, who is also chairman of PCNTDA, while inaugurating the road safety week at Pune RTO, said that the project of driving park is part of infrastructural development to be done for creating public awareness on traffic discipline. Read the rest of the article from Sakaal Times, Driving park planned at Pradhikaran. 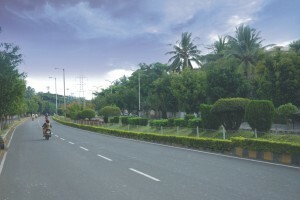 The Pimpri Chinchwad New Township Development Authority (PCNTDA), popularly known as Pradhikaran, has been a major catalyst in the planned development of Pune’s burgeoning PCMC area, transforming this once exclusively industrial zone into one of the hottest destinations for those buying property in Pune – and indeed in the country. Over the last three decades several thousand acres of land have been acquired, developed, zoned, brought into the jurisdiction of the Pimpri Chinchwad Municipal Corporation (PCMC) and PCNTDA and made available for residential and commercial purposes. The result has bee a paradigm shift in how the real estate market sees properties for sale in Pune. It can safely be stated that, in terms of the Pune property market, the Pimpri Chinchwad map will never look the same again. Under the leadership of capable and committed IAS officers, the development of this fertile Pune real estate Mecca spans the entire gamut of activities. These include multi–lanes roads (including the Spine Road), strategically located fly-overs, public parks and urban forestation, residential zones including MIG and LIG Housing on a public private partnership basis, ample potable water supply and a comprehensive drainage network. Simultaneously, other service sectors have also grown rapidly, particularly schools and colleges. There are now over 25 colleges in Pimpri Chinchwad, offering graduate and post-graduate education in virtually every discipline – healthcare, retail, entertainment, banking and financial services and public transport. These developments have attracted some of the world’s largest companies from the automobile, IT and engineering sectors. It will also become the home of one of India’s largest International Convention Centers (on a 200-acre plot at Moshi, just off the Pune-Nashik Highway.) The governing authorities’ vision for the ICC includes the intention of holding the international auto exhibition that will take place in India in 2012 there. Accordingly, a hall admeasuring 100,000 square feet is being developed – this hall will equal (if not rival) similar exhibition hubs in Munich, Shanghai and other major metros around the world. Leading builder-developers from the Pune property market have been quick to spot the opportunity to create ultra-modern residential complexes in this region. These complexes are being designed and executed to meet the lifestyle expectations of the cultured and cosmopolitan middle class. Another market driver is the fact that Pimpri Chinchwad now offers diverse career and business opportunities. Woodsville, the latest project by Pharande Spaces, is a prime example of the integrated town concept increasingly coming into vogue. Situated just diagonally across the ICC, Woodsville offers a wide choice of spacious two and three bedroom apartments and an array of amenities: shopping mall, multiplex, club and sports complex, school, hospital, hotel and wedding reception hall. Profuse tree plantation, play parks and podium lawns create a serene, healthy environment. Avinash Gokhale is Director – Marketing & Corporate Planning, Pharande Spaces – a leading construction and development firm operating in the PCMC area of Pune, India. The insurance cover for fire brigade employees has also been increased and has been made uniform. The PCMC has also decided to give insurance cover to 84 fire brigade employees and nine employees of the Bahinabai Chaudhary zoo.